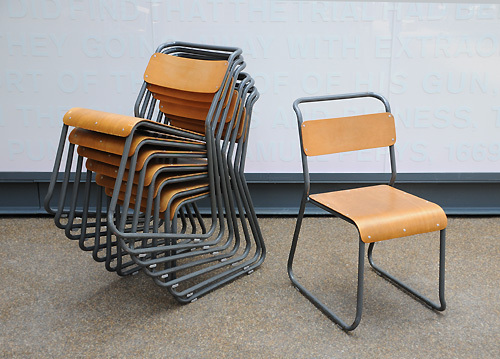 For the London Design Festival we will be hosting an exhibition in the forecourt of our Spitalfields Store to highlight some of the variety of British Steel-Tube Chairs manufactured from the 1930s to 1960s. The exhibition runs from 22nd-30th September 2011. Please come along to see it! A selection of 13 chairs from producers such as Bamco, Du-al, Cox, Pel, Kingfisher and Remploy will be on display. This classic British chair has had many variations of design within the same form. They were first supplied in the 1930s by firms such as PEL as contract furniture for railways, hospitals, universities and schools. These companies based mainly in the Bristish Midlands were associated with some of the great architects of the day. People such as Oliver Bernhard - the art deco architect and industrial designer; Wells Coates - the seminal figure of the Modern Movement; Serge Chermayeff - British Modernist Movement designer of the De La Warr Pavilion in Bexhill-on-Sea. The chairs were very successful and produced great revenues for Midlands firms during the economic gloom of the 1930s. The practical, clean and comfortable design of this 'austerity' chair is more appealing than ever today and their understated design is becoming sought after for today's vintage inspired modern interiors.